You may recall a series of earlier spy shots we posted of the Audi R8 Clubsport as it was testing at the Nurburgring back in September. Now, as the car's official reveal is two month's closer, we found new 'Ring spy photos and even a few (unconfirmed) details to add. First off, you'll see this R8 Clubsport test mule has shed it's earlier matte paintjob for glossier digs. More importantly though are a few rumors that are swirling. Word is, the Audi R8 Clubsport will be 115 kg lighter than the current R8 V10 and will produce 560 horsepower (versus the R8 V10's 525 hp). 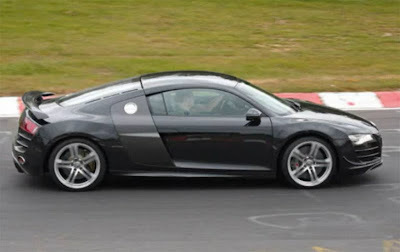 We're guessing the R8 Clubsport will make it's debut sometime in 2010 (Geneva Motor Show maybe?) and hit showrooms by 2011 (but hopefully sooner).